Clay vessels have been part of the everyday lives of the people of Southeast Asia for four millenia. Wherever there have been people, there have been pots, and the diversity of styles reflects the complexity of this region’s cultural heritage over time and across great distances. 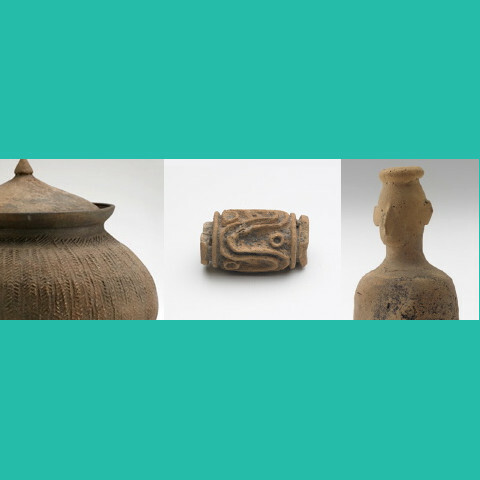 “Taking Shape,” an exhibition of some 200 examples dating from prehistory to the present is on now at the Sackler Gallery of the Smithsonian Institute, Washington DC. And there’s a spiffy online gallery, too, with images of every piece in the show. The collection was given to the Smithsonian over a period of years by brothers Victor and Osborne Hauge and their wives. What the Sackler site doesn’t say is that the Hauges’ history as collectors was an interesting one. Let that be a lesson to all of us who think our passion for collecting Asian art and artifacts is a disease to be cured. It’s a blessing. Like Gratia Hauge, I regret the things I didn’t buy, and am sad to remember that it was fear of overspending on objects of beauty and quality that restrained me. How foolish. I find the earthenware and stoneware pieces in the “Taking Shape” exhibition particularly beautiful. The forms are simple yet strong. They feel somehow iconic. Timeless. Elegant essays in the relationship of form and function, and objects of a tremendous yet understated beauty. Not enough attention and aesthetic appreciation have yet been devoted to the ceramics of Southeast Asia. This exhibition will help to change that.